There are as many kinds of frosting out there as there are cakes that need icing. And while I certainly have my favorite recipes for frostings, there are even more times when I find myself wingin’ it. I’m talking about those times when you’re making a quick and easy dump-it cake, decided to make cupcakes at the very last minute, or can’t bear to get out your mixer again to finish your favorite Bundt. These are the frostings for you. There are four kinds of frostings I regularly make without a recipe: American buttercream, ganache, whipped cream, and basic glaze. They’re all beyond easy and can be tweaked to make different flavors, colors, and textures. This is the easiest buttercream out there—I really like it for cupcakes and layer cakes. It’s made up of a 1:2 ratio of butter to confectioners’ sugar. Yup—that’s it. Cream the two together until they’re light and fluffy, 3 to 4 minutes. I like to use my stand mixer, but you can totally do it by hand in a pinch. From this base, you can go crazy—add a little bit of milk, cream, coffee, or juice to loosen the frosting or add additional flavor. You can fold in your favorite jam to give it a swirl of color and sweetness. You can add a small amount of cooled melted chocolate or any extract you choose. American buttercream is soft and fluffy when it’s freshly mixed, but due to the large amount of confectioners’ sugar, it gets that lightly crystallized layer on the exterior when it sets. 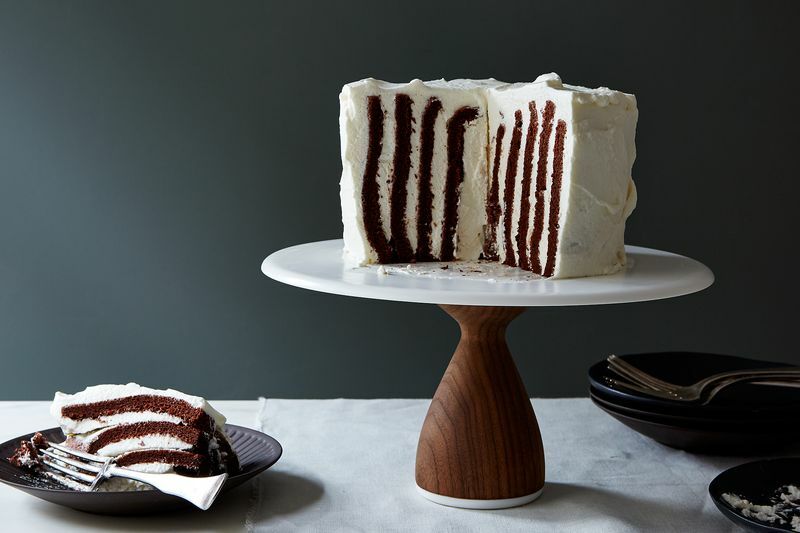 I love this, not only because it’s yummy, but also because it makes the frosting super sturdy—it’ll stay put, making it especially great if you’re transporting cakes, cookies, cupcakes, whatever! Ganache, made from chocolate and heavy cream, is no stranger to dessert lovers. It makes one of the best (and easiest) fillings and frostings out there—I like it for almost anything: layer cakes, sheet cakes, cupcakes, Bundt cakes. Not only can it be made with any kind of chocolate (with a few simple tweaks), the finished ganache can be manipulated in different ways to achieve different results. Chop your chocolate finely and place in a heat-safe bowl. Bring your cream to a boil over medium heat, and once it’s hot, pour it over the chocolate. Let it sit for 15 seconds, undisturbed, then begin stirring with a spatula in the center of the bowl, stirring in small circles until the ganache begins to come together. Start stirring in larger and larger circles until the ganache is glossy and smooth. I’ll use freshly made ganache to fill layer cakes or as a glaze. Or I’ll let it firm up at room temperature, then whip it in my mixer until it’s light and fluffy like buttercream (3 to 4 minutes should do the trick, be sure the scrape the bowl well a few times so it’s even throughout). Remember that different kinds of chocolate contain different ratios of cocoa butter and milk solids, which means they’ll need different amounts of cream to make the best ganache. For dark chocolate, use a 2:1 ratio; for milk chocolate, a 3:1 ratio; and for white chocolate, a 4:1 ratio of chocolate to heavy cream. If you’re looking to add additional flavors, try infusing the cream with anything from vanilla bean to tea to coffee to spices! Whipped cream is obviously a great frosting or filling for a cake. I use it for cupcakes, layer cakes, and naked cakes (cakes that are filled and topped, but the sides aren’t frosted). I usually start by whipping of 2 cups of heavy cream by hand or with an electric mixer. When the cream begins to thicken, I’ll gradually add 3 tablespoons sugar (superfine sugar is great if you can get it) and any extracts or flavoring. If you’re using it to fill or just top a cake, it’s best to whip it to medium peaks. But if you’re planning on using it to ice the outside of the cake, it’s best to underwhip it a little bit—closer to soft peaks. You want it to be firm enough to be easily spreadable, but you want to give yourself a little wiggle room. 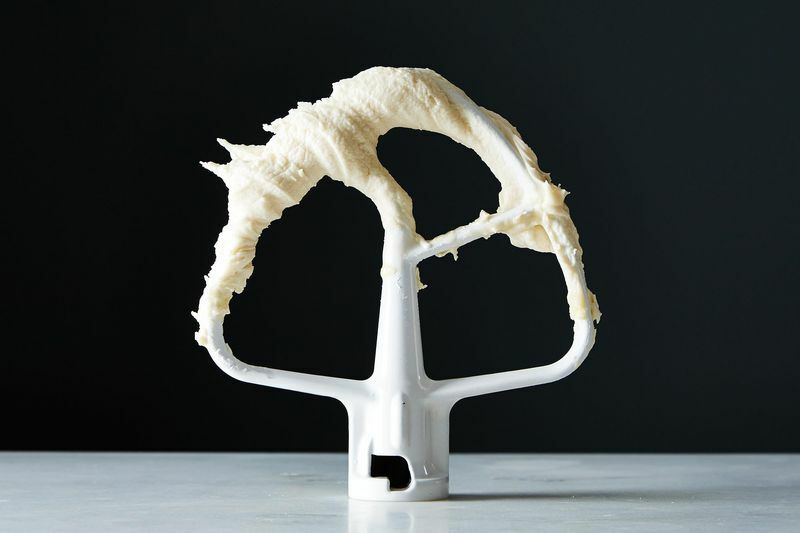 Because the longer you work with it, the more whipped it will get (so to speak). Over time, it can get clumpy and overworked. Sweetening it with confectioners’ sugar helps too. The cornstarch in the sugar helps a bit to keep the cream set once it’s on the cake, so it will hold a bit better. You can add cocoa powder, extracts, or a small amount of jam to flavor the whipped cream. There’s maybe no icing easier than my favorite basic glaze—on cupcakes, cookies, and Bundt cakes. I start with confectioners’ sugar and add liquid (milk, cream, coffee, and fruit juice are some of my favorites), then whisk until I reach the desired consistency. I usually start with 1 cup of confectioners’ sugar to 3 tablespoons liquid and go from there. If I’m looking for a thick glaze on top of a Bundt cake, I’ll use less liquid. If I’m looking to give a glossy coating to the top of cupcakes, I’ll use more liquid. Like I mentioned above, the cornstarch in the confectioners’ sugar makes the glaze set up, which is great for transporting and slicing. Remember that the more liquid is in the glaze, the longer it will take to set.